Former kingdom in Spain, surrounded by Aragon, Castile, and the Basque Provinces; now comprised in the provinces of Navarre (Spain) and Basses-Pyrénées (France). Sometimes independent, and at other times under French suzerainty, it finally became divided into a Spanish and a French province. It is known to have had a Jewish community before the end of the tenth century, and it may have had one still earlier. To repeople the depopulated cities after the expulsion of the Saracens, D. Sancho el Mayor, the first king of Navarre, endeavored to attract the Jews to his domains. They settled in the seaport towns of Pamplona, Estella, Olite, Tafalla, Viana, Funes, and Cortes, but principally in Tudela. The first kings appointed the Jews as guardians of the fortifications, and granted them special privileges ("fueros"). The reign of D. Alonso Sanchez el Batallador (the Valiant), which lasted almost thirty years, greatly influenced the civic status of the Jews in his dominions. In the "Fuero General" or "Fuero Foral de Navarra," which is attributed to him, they received full civil rights. For the laws governing the Jews see Kayserling, "Gesch. der Juden in Spanien," i. 194 et seq. Very unlike this tolerant ruler was his brother and successor, D. Garcia Ramirez el Monge (the Monk), who showed himself most liberal toward the clergy and the nobility at the expense of the Jews. In 1144 he gave the synagogue of Estella to the Church and transferred to the nobility of that town an entire village that had been built, and was then inhabited, by Jews. D. Sancho el Sabio protected the Jews against the animosity of the Navarrese, confirmed them in their former privileges, and granted them additional ones. He enacted that law-suits between Moors or Christians and Jews were to be decided only by such as professed the faith of the contending parties, and further that Jews were to pay tithes only on property acquired by purchase, and not on inheritances. Upon the death of D. Sancho el Fuerte, who had employed Jews as his financial agents, D. Theobald I. succeeded to the throne (1234). Like the other rulers of the Iberian Peninsula, he was requested by Pope Gregory IX. to force the Jews to wear a Badge to distinguish them from the Christians, but he declined to accede to the demand. As the protector of the Jews, Theobald endeavored to guard their privileges, and to defend them not only against mob-violence, as in the out-break at Tudela, but also against oppression by the municipal authorities. With the accession of Theobald II., son-in-law of Louis IX. (the Saint) of France, Navarre was placed under French suzerainty, and the Jews there were reduced to the same position as their French brethren; they were subjected to the same frequent decrees against usury and the same anti-Jewish outbreaks. Theobald II. was succeeded by his brother Henry, who died in 1274, after a brief reign. Civil disturbances then broke out, and those Jews who, as in Pamplona, rashly took part in the factional strife suffered greatly. A French army, which invaded the country to suppress the rebellion, pillaged the houses of the Jews and destroyed the synagogues (1276). Philip the Fair, acting as guardian of the young queen Juana, began his reign by levying a coronation-tax of 20,000 livres on the Jews of Navarre. He also relieved those inhabitants of Murillo, Cabanillas, Araciel, Corella, Buñuel, Ribaforado, Azagra, and San Adrian who owed the Jews money, from paying interest on their debts, which he canceled either in whole or in part. The more disturbed and critical the condition of the country became during the reigns of the feeble kings Louis Hutin and Philip the Tall the worse became the position of the Jews. In 1321 occurred the uprising of the Pastoureaux. The rapacious mob attacked the Jews in Tudela and slew many of them. The Navarrese hatred of the Jews, constantly increased by the incendiary speeches of the Franciscan monk Pedro Olligoyen and others, developed into frenzy. Immediately after the death of Charles I., who had reignedfive years, the storm against the Jews burst forth throughout the country (1328). Especially horrible was the massacre in Estella (Saturday, March 5 = 23d Adar), where the ghetto was burned and its entire population slain; the Jews were slaughtered also in Tudela, Viana, Falces, Funes, Marcilla (not Moncillo, as Grätz has it), and elsewhere. More than 6,000 lost their lives during these persecutions (see Moret, "Historia de Navarra," iii. 109; Yanguas y Miranda, "Dicc. de Antiguëdades de Navarra," ii. 113; idem, "Historia de Navarra," p. 168; Zurita, "Anales de Aragon," ii. 84a; Zacuto, "Yuḥasin," p. 224). Freed from the French yoke, Navarre received a king of its own in the Count of Evreux, who, with his consort Juana, was crowned March 5, 1329, as Philip III. The new ruler imprisoned the rebellious Franciscan Pedro Olligoyen and imposed fines on the cities of Estella and Viana, which were, however, remitted as an act of grace. On the other hand, he confiscated all property taken from the Jews and in addition imposed a coronation-tax of 15,000 livres upon them, robbed and impoverished as they were. Through the persecutions the Jews were completely separated from the Christians; their rights became more and more restricted, and they were allowed to get their corn ground only at the mills assigned to them. For trivial offenses they were hanged or buried alive. Their condition became still worse under Charles II. ; the people shunned them and they were confined to their narrow streets; and the taxes imposed upon them were so high that they could no longer raise the sums demanded. These sums amounted in 1384 to 12,000 livres for the Jews in the little kingdom; they were, moreover, forced to pay subsidies, and to lend money to the impoverished king. Everything they bought or sold, even the clothes they wore, were subject to heavy taxation. To this were added the horrors of war, while pestilence often demanded its sacrifices. It became almost impossible for them to remain in Navarre, and every one emigrated who could. Three hundred of the wealthiest families left Tudela. After 1366 there were scarcely 450 Jewish families in the entire kingdom. To make emigration more difficult for them Moors and Christians were forbidden to purchase real estate from them without the king's special permission. In 1380 the Jews were forced to pay an additional tax of five sueldos per livre on the prime cost of everything sold or mortgaged to Christians during the preceding fifty years. The condition of the Jews was ameliorated under Charles III., the son and successor of Charles II., who died in 1387. Soon after the accession of the new king the Jews presented him with 3,000 livres. In return he granted them several privileges, influenced, doubtless, by the fact that his court physician was Chief Rabbi Joseph Orabuena, whose son Judah was also a member of the royal retinue. During the king's journey to Paris in 1397 he was accompanied by four Jews—two physicians, a surgeon, and an astrologer. 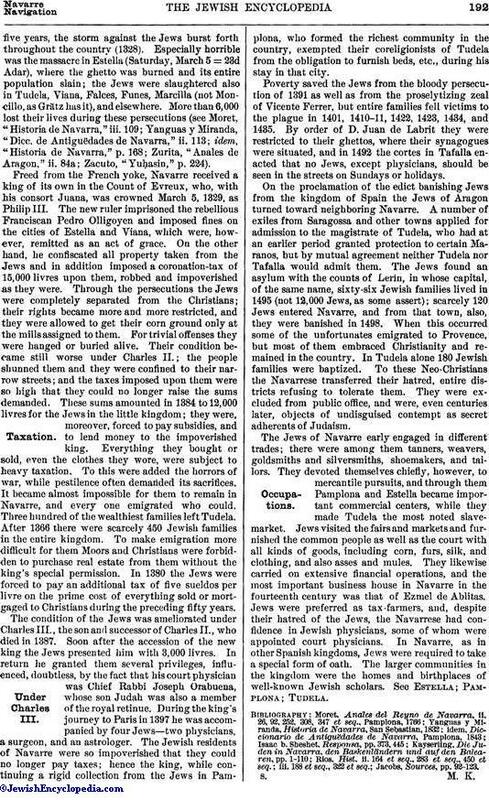 The Jewish residents of Navarre were so impoverished that they could no longer pay taxes; hence the king, while continuing a rigid collection from the Jews in Pamplona, who formed the richest community in the country, exempted their coreligionists of Tudela from the obligation to furnish beds, etc., during his stay in that city. Poverty saved the Jews from the bloody persecution of 1391 as well as from the proselytizing zeal of Vicente Ferrer, but entire families fell victims to the plague in 1401, 1410-11, 1422, 1423, 1434, and 1435. By order of D. Juan de Labrit they were restricted to their ghettos, where their synagogues were situated, and in 1492 the cortes in Tafalla enacted that no Jews, except physicians, should be seen in the streets on Sundays or holidays. On the proclamation of the edict banishing Jews from the kingdom of Spain the Jews of Aragon turned toward neighboring Navarre. A number of exiles from Saragossa and other towns applied for admission to the magistrate of Tudela, who had at an earlier period granted protection to certain Maranos, but by mutual agreement neither Tudela nor Tafalla would admit them. The Jews found an asylum with the counts of Lerin, in whose capital, of the same name, sixty-six Jewish families lived in 1495 (not 12,000 Jews, as some assert); scarcely 120 Jews entered Navarre, and from that town, also, they were banished in 1498. When this occurred some of the unfortunates emigrated to Provence, but most of them embraced Christianity and remained in the country. In Tudela alone 180 Jewish families were baptized. To these Neo-Christians the Navarrese transferred their hatred, entire districts refusing to tolerate them. They were excluded from public office, and were, even centuries later, objects of undisguised contempt as secret adherents of Judaism. 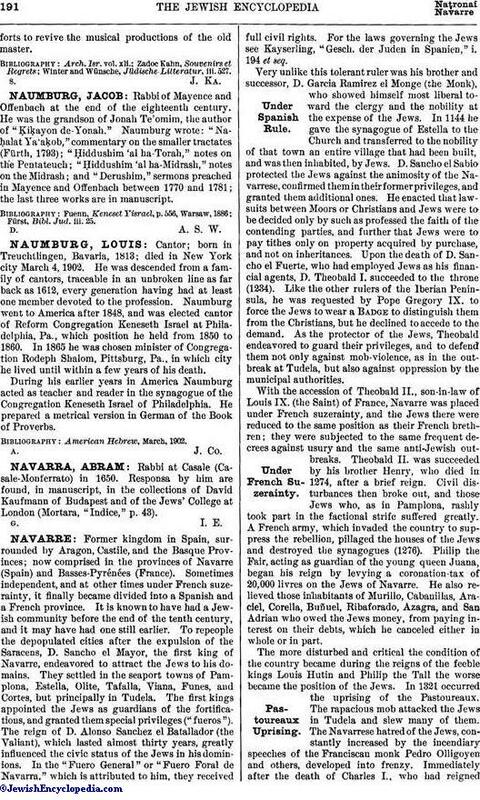 The Jews of Navarre early engaged in different trades; there were among them tanners, weavers, goldsmiths and silversmiths, shoemakers, and tailors. They devoted themselves chiefly, however, to mercantile pursuits, and through them Pamplona and Estella became important commercial centers, while they made Tudela the most noted slave-market. Jews visited the fairs and markets and furnished the common people as well as the court with all kinds of goods, including corn, furs, silk, and clothing, and also asses and mules. They likewise carried on extensive financial operations, and the most important business house in Navarre in the fourteenth century was that of Ezmel de Ablitas. Jews were preferred as tax-farmers, and, despite their hatred of the Jews, the Navarrese had confidence in Jewish physicians, some of whom were appointed court physicians. In Navarre, as in other Spanish kingdoms, Jews were required to take a special form of oath. The larger communities in the kingdom were the homes and birthplaces of well-known Jewish scholars. See Estella; Pamplona; Tudela.